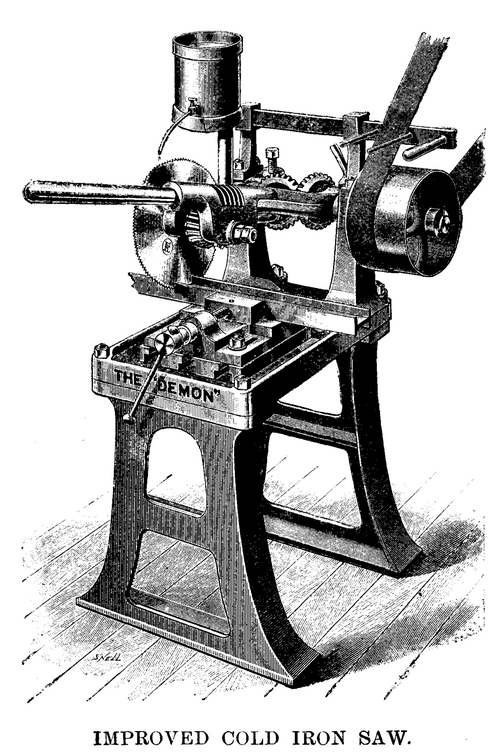 The engraving given herewith shows a general view of the "Demon" cold saw, designed for cutting iron, mild steel, or other metals of fairly large sections, that is, up square or round, and any rectangular section up to 8 in. by 4 in. The maker, Mr. R.G. Fiege, of London, claims for this appliance that it is a cold iron saw, at once powerful, simple and effective. It is always in readiness for work, can be worked by inexperienced workmen. The bed plate has T slots, to receive a parallel vise, which can be fixed at any angle for angular cutting. The articulated lever carries a saw of 10 in. or 12 in. diameter, on the spindle of which a bronze pinion is fixed, gearing with the worm shown. The latter derives motion from a pair of bevel wheels, which are in turn actuated from the pulley shown in the engraving. The lever and the saw connected with it can be raised and held up by a pawl while the work is being fixed. In small work the weight of the lever itself is found sufficient to feed the saw, but in heavier work it is found necessary to attach a weight on the end of the lever. The machine is fitted with fast and loose pulleys, strap fork and bar. We are informed that one of these machines is capable of making 400 cuts through bars of Bessemer steel 4 in. diameter, each cutting occupying six minutes on an average, without changing the saw. - Industries.